Here is my list of the best Maya animation books. This list is comprised of books that I found helpful to learning how to animate in Maya. Being a relatively new animator (I have been studying for three years), I can tell you these books have helped me understand Maya a lot more! If you have any suggestions, on books I should add to the list, submit them! Please note these are not the best Animation Books, that is a completely separate category. These are more technical and are not meant to teach the Principles of Animation. Anyway, here is my list of the best Maya animation books. 3d Animation with Maya 7 by Patrica Beckman and Phil Young is a must have, it takes the number one spot on my best maya animation books list. Now before you go crazy and say, wait we are on maya 2013 (soon to be 2014), why are you suggesting a book about Maya 7? Hear me out a bit. This book is great for beginners, yes some of the tools have changed but not by much. The basics, that all Maya animators use, still apply today. The authors Patrica Beckman, manager at Disney Circle Seven studios, and Phil Young, a professor of Animation at Savannah College of Art and Design (Scad) know what they are talking about. The book gives you step by step tutorials and goes through all the major tools needed to animate in maya: graph editor, the dope sheet, walk cycles. They do a very good job relating it to an artists needs. If you are a true beginner to animation this book gives you some of the principals of animation. Rather than focusing on every aspect of maya, like modeling, rendering, and lighting, 3d Animation with Maya 7 focuses solely on animation (hence the title). I recommend this book to anyone that wants to learn animation and isn’t too concerned about the other disciplines. Also this book is only about 260 pages, it doesn’t look daunting or scary, so that helps with intimidation factors. This book comes with a cd so you can view the scenes they work on. Although older, I consider it the granddaddy to the newer how to animate in maya books. 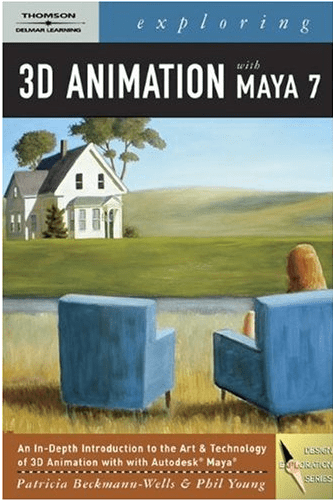 Best of Maya Animation Books – Number 2. How to Cheat in Maya 2013: Tools and Techniques for Character Animation. 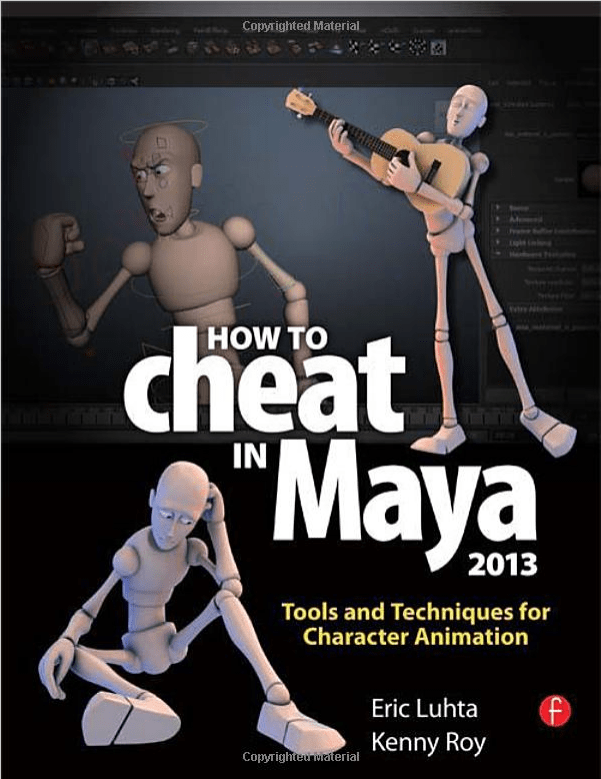 How to Cheat in Maya 2013: Tools and Techniques for Character Animation is written by Kenny Roy and Eric Luhta. Kenny Roy, a professional animator and studio owner, creates some amazing resources for animators . If you are animator, or want to be one, you should check out his web site kennyroy.com. It is super helpful and will be writing a review about it here in a couple weeks. This book to me is a very close number 2. In fact you can probably count it as a tie with the first book. I really like this book so it made my best Maya animation books list. But, this book is probably meant a bit more for experienced beginners or intermediate animators. How to Cheat in Maya 2013: Tools and Techniques for Character Animation cuts the nonsense and focuses on the tools animators should know. This book is the ultimate cheat sheet and helps improve workflow. Kenny Roy did an amazing job at writing this book, so it is easy to follow. Also, it has great in color graphics. Here are the chapters and topics he covers: Animation Principals, Splines, Graph Editor, Techniques, Constraints, Rigging Cheats, Cameras, Workflow, Cycles, Referencing, Facial Animation, and Animation Layers. Really there is more than just the chapter titles, he goes well into every topic.I would say however that this book is more for those who are newer to animating in Maya, it would probably be know the basic structure and usage of Maya. While it is super helpful for intermediate animators, it might be daunting for beginners. As a side note, How to Cheat Maya 2013 comes with a web site where you can download sample files! Introducing Autodesk Maya 2013 is written by Dariush Derakhshani. Now if you are a true beginner it might be best so start with this book Introducing Autodesk Maya 2013. 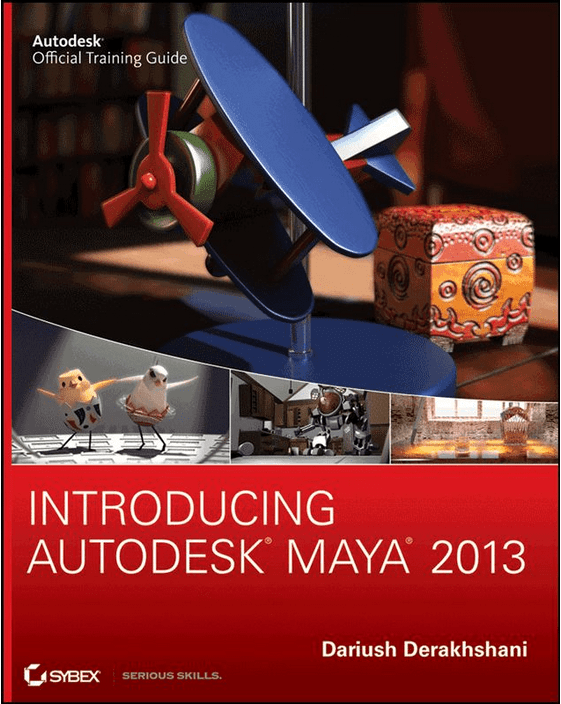 Introducing Autodesk Maya 2013 covers ALL Maya subjects, not just animation. This book goes over modeling, rigging, lighting, rendering, animation, and more. The books give decent tutorials on how to model, rig, and animate. Which, if you are wanting to do animation it might be good to know the basics for the different disciplines. Personally I find the size of this book kind of scary, it is huge. But, it is a good resource to have and provides reference if you ever need to do something random. This is a decent starting point for true “newbies”. In conclusion, I hope you enjoyed my best maya animation books list. If you are brand new to maya I would probably lean towards Introducing Autodesk Maya 2013 and 3d Animation with Maya 7. I feel like these books are better suited towards beginners. If you have some experience with other 3d applications I would get How to Cheat in Maya 2013 (it will soon be 2014 I am sure). This book will help you with your work flow and make Maya do tasks you didn’t know existed. I would also check out Tradigital Maya: A CG Animator’s Guide to Applying the Classic Principles of Animation and Animation Methods: The Only Book You’ll Ever Need. Let me know if you disagree with my list, remember this is only my personal opinion. Also be sure to give me your suggestions!